Well it’s been just about a year since I started Plant of the week and there are so many plants left to feature and some that surprise me I haven’t featured before and hellebores fall into that. It surprises me as I do love love hellebores and this one has become a firm favourite during the past few years since I first saw it. Normally a this stage I would tell you about the plant and where in the world it came from but this hellebore is a cross between H.niger and H.x hybridus. It’s not often these 2 hybridised, indeed it was only the second time it happened. This hybrid was found here in the uk by David Tristram, Walberton Nursery, West Sussex in 2000 but wasn’t released until 2009. It was named for his wife Rosemary. Helleborus niger and helleborus x hybridus hybrids have been hybridised in Japan before but have never really been commercially available until this form was bred. 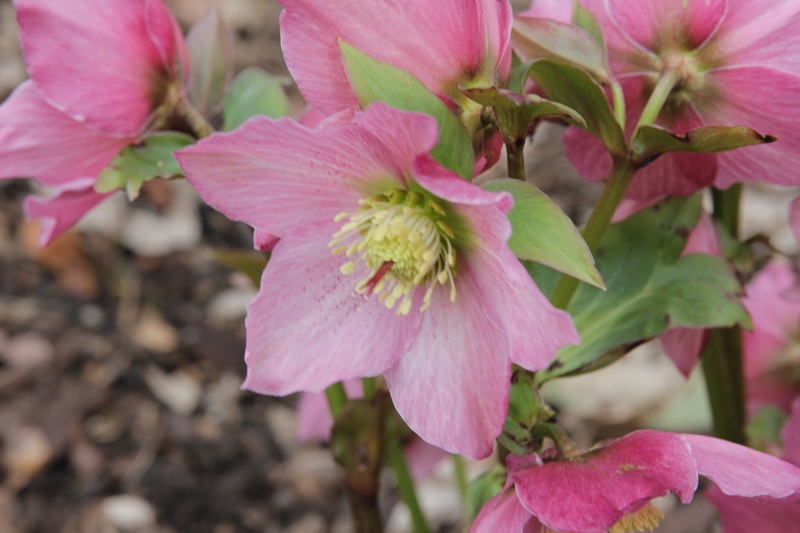 The name helleborus comes from Ancient Greek words, Helen meaning to injure and bora meaning food. Helleborus x hybridus Walberton’s Rosemary ‘Walhero’ makes a excellent garden plant. It needs a good fertile soil with some moisture retention, it’s quite happy to grow on most Ph soils as long as it doesn’t dry out or get too waterlogged. But unlike most hellebores, Helleborus x hybridus Walberton’s Rosemary ‘Walhero’ is more happy in light semi shade and full sun than shady spots. Helleborus x hybridus Walberton’s Rosemary ‘Walhero’ starts flowering about now and will flower for a good 4-8 weeks depending on the weather. The flowers themselves are sterile meaning they don’t set seed, the best way to propagate them is by division. This is best carried out in the autumn or after they have finished flowering. Here’s my blog on dividing perennial plants. The wonderful this about hellebores is that deer and rabbits don’t like them at all and will leave them alone. They do suffer from a few other pests as well like hellebore aphids, hellebore Black Death, hellebore leaf miner and hellebore leaf spot. It does seem a lot of problems but they are pretty easy to look after and don’t often suffer with many problems. The only maintenance they need is their old leaves and finished flowers to be removed. More information about how to do that can be found here. It is worth giving them a feed of Vitax Q4 after they have finished flowering and also a good mulch of garden compost or recycled green waste. Nice choice! Do love Hellebore, great bit of winter interest and a nice flower as well. Must get a few of these in the garden somehow. Goodness! If hellebores grew like that here, I just might like them too! ‘That’ is why so many are writing about them now! One of my favorites! Looking forward to seeing their return in March!